The single most frequently asked question we receive here at TLCB Towers is ‘How do I build this model?’. We receive queries like these in the hundreds, and – despite our urge to scream ‘enough!’ and run out of the building brandishing whatever office implement is nearest – we offer a continuous stream of polite replies explaining that the models we feature are not official LEGO sets and thus instructions are not available. Well, finally, we have a generic answer that may actually be helpful! Legendary (and prolific) vehicle builder Peter Blackert (aka LEGO911) has appeared here at The Lego Car Blog numerous times, and is therefore probably responsible for generating some of the ‘How do I build this model?’ comments himself. Now, after years building stunningly realistic vehicles numbering in the hundreds, Peter has published a book containing full-colour illustrations and step-by-step instructions for many of his models! Vehicles such as the 1932 Ford V-8 Roadster (pictured above), Datsun 240Z, 2016 Le Mans Ford racer, Ferrari 250 GT California, Jaguar E-Type coupe and convertible, Ford F150 Raptor, Bugatti Veyron, Porsche 911 and many more are all featured, allowing you to build and modify these for yourself using your own bricks! We’ll be bringing you a review of Peter’s book ‘How to Build Brick Cars’ in due course, but until then how did Peter go from uploading his Lego creations online to having a book published and available for sale all over the world? Find out as Peter joins us as the fourth builder in our ‘Become a Lego Professional‘ series – click the link below to read his story. Click here to read How Peter Blackert became a published Lego author! Expensive, hard work and very pretty. Italians eh? 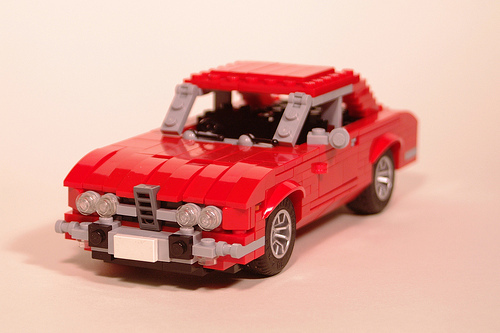 Lego911 is back, with this gorgeous ’60s Alfa Romeo GTV. There’s not really much more we can say on this one, because, as with all Alfas, the best thing to do is just look at it. For more pictures visit Lego911’s superb Flickr Photostream.